AFTER the success of The Handmaid's Tale, author Margaret Atwood is back in vogue. If you're hanging out for the second season of the Elisabeth Moss-led drama, Alias Grace will more than satisfy until then. A dynamic TV production adapted from Atwood's book of the same name, the show dropped on Friday and it's made by prominent female Canadian filmmakers Sarah Polley (Away from Her, Stories We Tell) and Mary Harron (American Psycho, The Notorious Bettie Page). Alias Grace, the series and the book, is historical fiction based on a real-life figure, Grace Marks, a notorious Canadian "murderess" of the 19th century. In 1843 when Grace (Sarah Gadon) was 16 she was convicted of the murder of Thomas Kinnear (Paul Gross) and his housekeeper Nancy Montgomery (Anna Paquin). 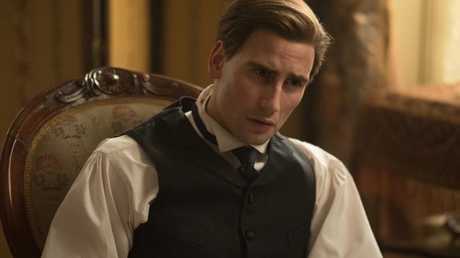 Framed by conversations with proto-psychiatrist Dr Jordan (Edward Holcroft), Grace reveals how she came to be a convicted killer. Her supporters hope that the good doctor's report will exonerate Grace from what they see as a miscarriage of justice. The historical narrative around Marks has always involved the question of her guilt - was she a devilish killer or an unwitting accomplice who didn't know any better? The curiosity surrounding Marks has turned her story into legend - this placid figure who might be capable of a terrible crime. This is the tension at the heart of the series as the character peels back, layer by layer, the events that led to her incarceration. She holds things back - from the doctor, from us and from herself. With little education, her drunk, abusive father forced her out to find a job and send money back to support her seven siblings. She becomes a servant in a well-to-do household and strikes up a friendship with radical socialist and fellow housemaid, Mary. The bond between the two girls is one of the few happy moments of her so-far unfortunate life. As is the case with much of Atwood's written work and the screen adaptations born from them, women have been dealt a sh*tty hand. Just like in The Handmaid's Tale, Alias Grace is unflinching in its portrayal of the persistent cruelties - small and significant - faced by women, the things that condemn them to a wretched life. One of the highlights of the series is the character development in Grace. The naive young Grace we see in the early flashbacks is a different creature to the one talking to Dr Jordan. The older Grace is wizened and more confident of her place in the world, even if there's a certain tragedy to her resignation as a "celebrated murderess". It's a testament to Gadon's talents that she is entirely convincing as both. Polley and Harron's production pays homage to Atwood with their balance of the wider story arc while being generous with the little details - the colourful quilts blowing in the wind or the sparing and effective use of flashes of crimson blood as foreshadowing. Through Polley's rhythmic writing and Harron's moody visuals, Atwood's beautiful prose has been translated to moving poetry in this engrossing series. Alias Grace is a sumptuous, enthralling piece of work. Alias Grace is available on Netflix now. For geek-outs about TV and movies, follow @wenleima on Twitter.